Pay equity supports equal pay for equal work—typically between genders. Organizations are getting serious about managing pay equity for three reasons: first, to improve their employment brand and results by attracting diverse talent; second, to comply with labor laws like the Equal Pay Act; and finally, because it’s the right thing to do. Working with a Professional Employer Organization (PEO) like ADP Total Source is a fast way to move your organization towards pay equity and ensure human resources (HR) best practices. It’s like having your own HR department. Achieving pay equity requires you start at the beginning—the very moment you decide that you need someone to fill a job. The pay offered in a position should be based on your job description and what the required duties are. It doesn’t matter if it’s a forklift operator or a nurse. Gender and other worker traits should play no role in your job offer salary amount. Here are three changes to make to your hiring practices to ensure pay equity. Many states, such as California, Delaware, Oregon, Vermont, and Massachusetts, have implemented laws to prevent employers from asking about salary history. Connecticut is next (January 2019), and many larger cities such as New York, San Francisco, and New Orleans have followed suit. Why? Because prior salary has no bearing on whether a candidate can do the job or not. In fact, that question furthers gender discrimination in pay by facilitating wage suppression as employees move from job to job. The Institute for Women’s Policy Research breaks it down even further. The next time you post a job, determine the salary in advance. Then, regardless of whether the candidate you hire identifies as male, female, or is from a diverse background, offer them fair pay for doing that job. Factors like race and gender have no bearing on their work. 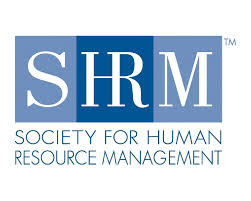 For compensation best practices or legislative updates, you may want to join the Society for Human Resource Management (SHRM), and check your state labor laws. For our recommendations on the best interview questions, read our article on the 100 best interview questions. Remove gender-biased terms from your job description, including gender-specific references and pronouns. Instead, focus on the work-related requirements and experience. 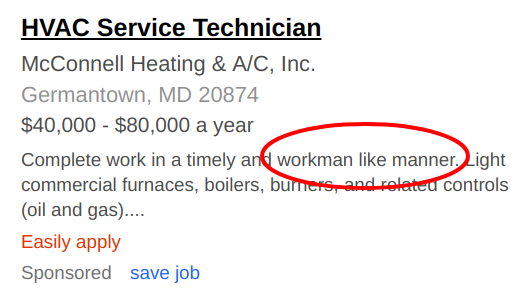 For example, a job foreman implies that it’s a male, and may cause females not to apply. Here’s an example found with a quick job search on Indeed, which is the largest job search site. 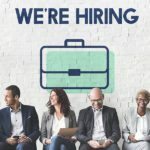 Not only will fewer candidates submit resumes, but females without “foreman” experience may be offered lower pay due to a perception of missing experience, even if you hire them for the job. Female applicants may well have supervisory and management experience, even in manufacturing or construction. Isn’t that what you’re really after? Jobs like flagman, mailman, serviceman, and maintenance man are examples of job titles and descriptions that may need to be revised to make them more gender neutral, eliminating bias that may cause your business to offer lower pay to females in those roles. Many screening questions have been added to find the best candidate, but some discriminate against female and diverse applicants, causing them to be paid less, even when they are hired. Education and industry experience are two examples. For example, if you have a job and screen for individuals who have degrees in economics or engineering, you’re going to get fewer diverse applicants and screen out top talent that can do the job. 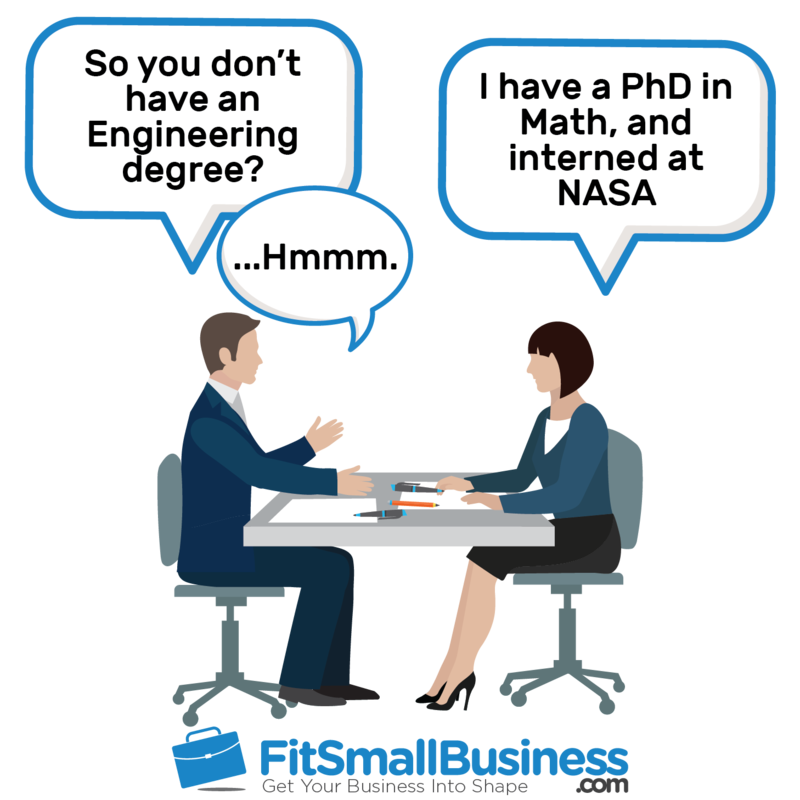 However, if you open the job to candidates with business or math degrees, you might find you have more diverse individuals apply. They’ll have very similar skill sets, and you’re less likely to penalize female workers by requiring degrees in fields that have been traditionally male-dominated. Further, if you focus on the skills needed, rather than the industry, you’ll find there are plenty of strong candidates with technical skills, leadership skills, data analytic skills, and problem-solving skills that come from more diverse backgrounds. As long as they can do the job, why should they be paid less? Even something as innocent as a company photo may convey a lack of diversity at your firm. It may sound backward, but before you can fix equal pay issues, you must first correct any structural issues affecting your company culture. If your team doesn’t welcome diversity, you’ll have to fix that first. 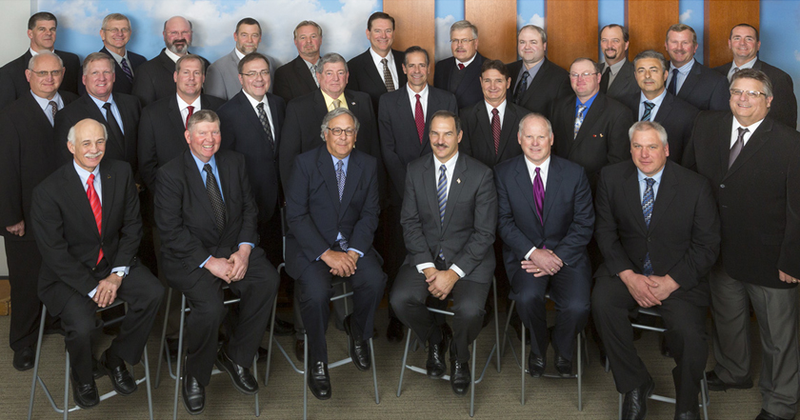 For example, if your board of directors and top-tier executives are all male, like in the photo above, you may have a problem. This continues to be an issue. A woman can do twice the work in a male dominated culture and still be paid 20 percent less. It’s because we’re afraid to ask—afraid we’re going to lose our job. I finally got to that place. I requested to be promoted to CFO and to be paid accordingly. It worked. Here are three way to ensure pay equity, even if your culture is skewed toward one race or gender. If you’re in a leadership or HR role in an organization that lacks diversity, you’ll need executive support in order to address pay equity within your current employee population. Once you find one or more who are supportive of equal pay, ask them to be the champion or sponsor of equal pay initiatives in your business. Get your leaders to recognize that something is missing—thought leadership. It’s not just about the women’s issue, but it’s about the organization. Women need to be knocking on the doors of the conference room and find CEOs and male allies. There needs to be a cultural shift. People are only going to give their full discretionary effort if you start to recognize and reconcile the relationship between the power players and the workers. You need to see every person as equal—not better, just different. Executives with a legal or finance background make good sponsors. Attorneys understand the legal ramifications of pay discrimination. 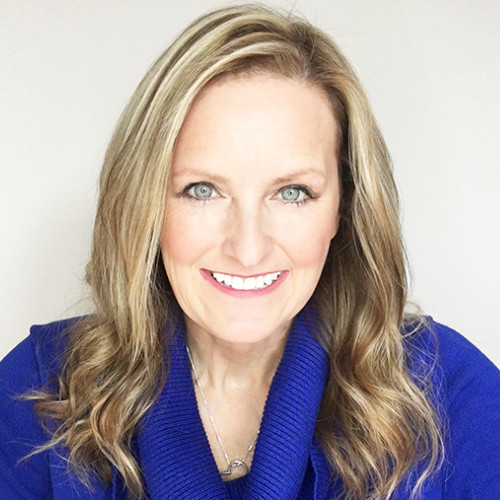 Finance folks tend to understand the risk that a lack of diversity can cause as well as the financial benefits an organization reaps when it has a workforce aligned with its client or consumer base. Another solid way to improve a culture that doesn’t see an issue with unequal pay is to provide data and education on the value of diversity in the workplace. While some may offer excuses as to why the female supervisors make less than the males (less experience! unrelated degree! ), they’ll often jump on board when they see research-based data on how fair pay aids retention, reduces lawsuits and improves business outcomes. Once you eliminate pay inequity upon hiring and have a sponsor to support fixing pay issues, the process to review your current payroll to find current issues with pay equity is easy. Some payroll software may provide reports to do this, but if not, here’s the data you need gather, and a sample template to gather it. Sample template to determine pay equity. Download and customize this XLS file. Unless you’re using an HR system, this data may reside in multiple locations. You can probably download data from your payroll system as a start. Then, add what’s missing based on your organization chart, job applications, personnel files, employee resumes, or manager input. In official terms, this is called a comp analysis. It’s meant to look at pay and compare it by gender, for example. Employee Name – If your company is small, the first name is fine. Otherwise, consider putting the names in alphabetical order by last name, such as Smith, Steve. That makes sorting easier, and you can identify pay issues down to a person. Team or Category – If you have more than a dozen employees, this will help with sorting. It may include a descriptive label like “operations,” “office,” or “sales.” It’s helpful if you want to compare salaries within teams or departments. Job Title – This can be the employee’s official job title, like “quality associate level II,” or it might be a simple title for comparison, like “admin,” “service,” “consultant,” or “CSR.” These will help you compare pay for employees across similar job roles. Gender Identity – This will help you sort, sum and see at a glance if one gender is being paid more than another. It’s included for looking at wider trends that affect “all females,” for instance. If you want to eliminate bias, you could input the genders as 1 and 2, x and y, instead of F and M.
Diversity – This could be an indicator as to whether this employee fits into any diversity category. It can be a checkbox for yes, or blank if no diversity classes are relevant. You would use this if you want to see if your pay is fair based on age, race, disability or other protected classes, in addition to gender. Pay Rate – To keep things fair across part- and full-time staff as well as exempt versus non-exempt pay groups, it’s best to convert pay to a common rate, such as hourly pay. Education Level – While this shouldn’t be used to drive pay unless the education level is critical to the job, it can help you see why one employee is (or should be) paid differently than another. Levels could be NA, High School, College, Post-Grad, or any level you choose. Management Level – This should be an indicator of supervisory responsibilities, which is often a reason one employee is paid more than another. If your organization has few levels, you might indicate “no” or “yes.” However, if it has several levels, you might number them or list them: none, lead, supervisor, manager, director, executive. Each level might well warrant a higher pay rate. Related Experience – This should be listed in years. It is tricky because you may have an employee with oodles of experience in another role that’s irrelevant in the current role (unrelated experience shouldn’t affect current pay). For example, an inventory stocking clerk who moves into an accounting role won’t have as much accounting experience as someone who’s been working as an accountant for years, inside or outside your company. List the number of relevant (not total) years. Scope – Scope can affect pay. For example, one employee might be responsible for $100,000 in revenues while another is responsible for $1 million. You could also put scope in as a relative value: small, medium, large, enterprise. The breadth or scope of a job may affect what they should be paid. Other – Add other data fields that affect pay in your business or industry as needed. Your industry may require licenses and certifications, such as HR certification, an electrician license or financial certification. Employees in those jobs may rightly be paid more than staff without credentials. In addition, it’s common to pay high performers more than lower performers. However, in order to support inequities in pay based on employee performance, however, you’re going to need a robust performance management system. Otherwise, to an outsider, it’s going to look like favoritism or discrimination. Why? Because most poor performers are exited from a company over time; only those who meet or exceed expectations tend to remain in the workforce longer term. 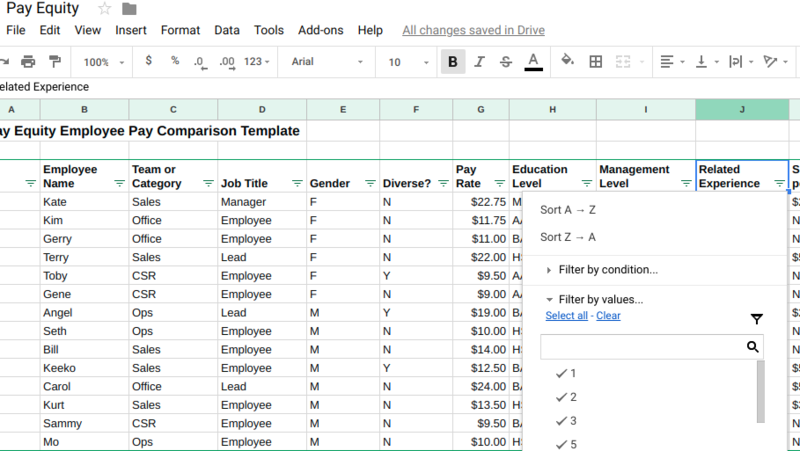 Next, create a spreadsheet or table and dump all employee names and job titles into that sheet. You can use ours as a starting point. Adding filters can help—the data can then be sorted and filtered by gender, pay rates or management level, as examples. Once you have collected the data, you can eyeball it, sort by jobs, pay rates and education levels, and look for anomalies. 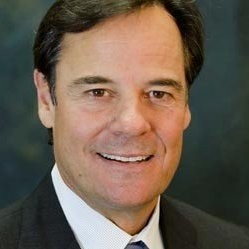 It’s easier if you have multiple employees doing similar jobs than if every employee in your organization has a unique job description. Even so, all workers with similar levels of education and work requirements, even if they have different jobs, should be paid similarly. If you’re tech-savvy, you can create pivot tables by job title, education level, and other factors. Start highlighting data that doesn’t make sense—such as two workers with different pay rates doing the same job. You can highlight with a highlighter pen, make comments in your spreadsheet, or shade the data fields. Notice in this chart that when you filter only for management jobs, one female manager is paid less than a brand new male lead with less experience. In fact, she’s paid almost the same as one of her direct reports, who has much less financial responsibility. What matters is that you start to find patterns in the data. Patterns don’t indicate something is wrong—they simply indicate a finding that’s different than expected. For example, two workers may have markedly different pay in the same job if one also does sales, or one has certification and significantly more years of experience. Why are 90 percent of our wait staff female, and most of their shift leaders male? Why are our newly hired male IT staffers getting paid more than the experienced females in IT? Why are male managers given a 6 percent salary increase on promotion, when female managers only get 3 percent? Why are female supervisors with degrees making less than male supervisors without degrees? Why is Matt making more than Susan when they’re both doing home care and Susan has a nursing license? Why are females making only 72 percent of what males are making on average? In best-in-class firms, HR staffers do this work on a regular basis. After all, the EPA requires pay equity. But employees in general, based on the research shown below, don’t think their pay is either fair or determined in a transparent way. Therefore, it’s better for your business to address the issue of pay equity before one of those employees decides to lodge a complaint. Answers to the questions above will invariably prompt you to make a to-do list of things to look into and/or fix. Some fixes may be small, like giving your female insurance agents a $.50 raise so that they’re on par with your male insurance agents. Do this on your very next pay period. Others are more complex and may represent systemic issues. Perhaps you have a policy that says no one can get more than a 10 percent salary increase on promotion. That reinforces low pay for females coming up the ranks who may have started off at a lower rate. Depending on your job role, you may need executive approval to change that. Base salary increases on job duties rather than a standard dollar amount or percent. 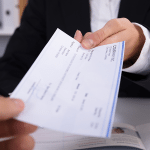 It’s important to review your pay policy to avoid incentive pay programs that put one person’s pay above another, such as offering bonuses or salary increases inconsistently. Therefore, your only option is to increase the pay of those workers who are underpaid relative to their peer counterparts. That will increase your overall payroll and can be expensive. It’s not about what the marketplace pays for a job. Your employees may be paid more or less than a business next door. Instead, it’s about having two people in the same job within your own company. Those individuals must be paid fairly in an equitable manner. In one organization I worked in, a salary review determined that a female business analyst was being paid about 30 percent less than her male counterparts. HR fixed the issue immediately and uncovered the reason as well (the organization had had a salary freeze at the time she was promoted, and never went back to address her pay). Giving someone an immediate 30 percent salary increase can be costly, but it’s like ripping off a band-aid. Do it quick and let the organization start to heal from unfair pay practices. You may uncover systemic issues, like managers not having a structured compensation system or lack of a performance management process. Those are fixable HR issues; others ways to address pay inequity are described below. Once you have the levels created, you can begin to educate your managers what to offer for salary increases and raises based on predetermined criteria. For example, you may want to have a rule that a job promotion must bring an employee into the correct pay range, regardless of whether it means a large percentage increase. Or consider a rule that once an employee hits the top of their pay band, they are no longer eligible for pay increases unless they are promoted. Instead, they may be eligible for a one-time performance bonus instead. There’s no need to pay an employee more than a job is worth, regardless of how long they’ve been doing that same job. Unless, of course, they’re your top performer. Instead of providing salary increases based on manager recommendations (which may bring unconscious bias into play), make them based on measurable performance metrics. Consider 360-feedback reviews and KPIs. Then, provide increases based on actual work that employees contributed, rather than how well they’re liked by their boss, or how long they’ve been in the company. Before you provide a candidate with a job offer, determine what that job should pay in the market, your industry, and your location. Also, to ensure pay equity, take a look at what similar roles are paid in your own firm. Similarly, before you promote someone, take a look at what others in similar roles are making at your company and do your best to ensure the promotional salary increase is fair. Most companies don’t share their pay rates with employees, but your employees talk. They’ll likely know if the pay is fair or they’re being short-changed. Just because a female manager will accept a lower pay rate doesn’t mean giving her one is right. In fact, it’s against the law, albeit hard to enforce. If you’re in HR, you may need to coach female employees to apply for promotions, and support them when asking for salary increases. Best-practice firms evaluate their pay annually. They know that fair pay contributes to worker satisfaction. Many companies share what pay rates are within what’s known as pay bands, which are similar to the pay ranges shown in the table above. Each worker then is told what pay band they’re in based on their job role. Employees are aware of the pay bands (salary ranges) for most jobs. Entry-level clerks may be in the lowest pay band, while manager pay bands are in the middle, and executives are paid the most. However, within pay bands, there should be no inequity based solely on gender or other diversity characteristics. Promotions and pay increases should be based on fair, objective and measurable criteria. Your business may risk being audited or sued otherwise. Ban salary history inquiries to stop perpetuating historic pay discrimination. The jobs need not be identical, but they must be substantially equal. Job content (not job title) determines whether jobs are substantially equal. You need to compare required skills across jobs and job levels. Do your best to put each job in its proper category based on the job description. Then compare pay across those required skills and job levels, not just job titles. Pay equity and equal pay have both social connotations of fairness, as well as legal definitions. Therefore, it’s not surprising that questions arise. What is the difference between pay equity and pay equality? According to PayScale, pay equity implies that pay is fair, but not exactly the same, as individuals can have differences in their backgrounds (education/experience/training) as well as their performance. Two individual in a similar job may have pay equity, but not equal pay. In other words, they are not paid the exact same amount. You may have come across the Pay Equity Act when researching this topic. However, the pay equity act is a law in Ontario, Canada, not in the U.S. It requires employers to correct gender-based pay issues and can be used as a model for best practices. If you’re an employer in Ontario, you may want to read this article from the pay equity commission to make sure you’re up to speed on what’s required. What’s the difference between the Equal Pay Act and FLSA? The Fair Labor Standards Act (FLSA) documents federal labor regulations. The Equal Pay Act is an amendment to the FLSA. Both are administered by the U.S. Equal Employment Opportunity Commission (EEOC), which is where an employer can learn more—and where employees can file a complaint. Pay equity makes sense to fair-minded individuals. But applying it can be tricky, as each human being brings unique skills, experiences and contributions to a job. Pay equity may not mean that two people doing the same job are paid exactly the same dollar amount. But it does mean that the pay is fair based on differences that are job relevant—such as performance, education, experience and tenure. Pay equity is just another requirement in the universe of employment law that many small businesses find difficult to keep track of. Therefore, ADP Total Source offers a solution. Their PEO can help you with all aspects of employment law, from fair hiring practices to equal pay, while giving your team members easy access to all their work-related data—from performance reviews to pay stubs.